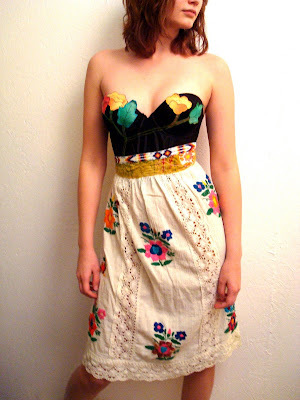 My internet friend, Melissa posted recently about Rubypearl, an Etsy seller who makes pretty awesome dresses and corests out of vintage materials. The dresses can be a little out there, but they’d be perfect for Coachella or Bonnaroo…you get the idea. Melissa recently wore the dress below to sxsw. Woah, I didn't realize you posted about this! It popped up in my "you might like" section while reading your blog. Love it, and love the blog, schlo.